Towering evergreens. Endless moss and ferns. Miles of waterfront. Snowcapped mountains. Need a cure for gray-season blues? Frosty Moss has you covered. From the Sol Duc River to Blyn, the entire 80-mile course follows both the paved Olympic Discovery Trail and the singletrack Adventure Route. 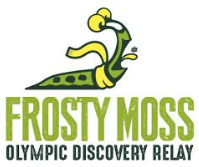 As if your day wasn’t epic enough, get ready to eat, drink, and celebrate during the Frosty Moss Relay after-party at Club 7 at 7 Cedars Casino. Tasty refreshments guaranteed. Run through the restored McPhee Tunnel. Trust us: Take the quick detour for the view from the bridge over Devil’s Punchbowl. Pavement gives way to 25 miles of trail running. Think dense forest opening up to big views of the Olympics, the Strait of Juan de Fuca, and Canada. Run across the wild and free Elwha River on the Olympic Discovery Trail’s suspended pathway. Foot for scale. This beast lives on Leg 4. Watch your step. Frosty Moss 101: How Does a Relay Work? 1. Form a team of 3 or 5 runners. 2. Load up your team vehicle with food, drinks, extra layers, tunes, and teammates. 3. Drop off your first-leg runner at the start line. They run to the next leg’s starting point (aka the relay exchange). 4. Meanwhile, the rest of the team drives to the next relay exchange and waits for the runner. 5. Runner arrives at exchange, tags the next runner, who runs to the next exchange. Tired runner gets in van. 6. Repeat until the finish line! Support Local Events: Be a Sponsor or Volunteer! Email Peninsula Adventure Sports at contact@peninsulaadventuresports.com to find out how your business or organization can partner with the Frosty Moss Relay. A portion of Frosty Moss Relay proceeds benefits the Peninsula Trails Coalition volunteers, who help to maintain and build the Olympic Discovery Trail and Adventure Route.